Danny Tozer is transgender. That's cool, but I wouldn't have read this book if that had been the focus. I was drawn in by the superhero plot and I appreciated that the gender issues were only part of the character development. As I told a coworker, I don't read issue books. If you want to talk about an issue, you had better have something else going on to carry the story. For instance, Jumper is a book about an teen boy who finds his way in the world after escaping from an abusive home. The fact that he escapes by teleportation is what makes the book interesting. On the other hand, the teleportation alone would not have made for such a compelling and memorable book without the underlying childhood trauma, which is why the book works on so many levels. 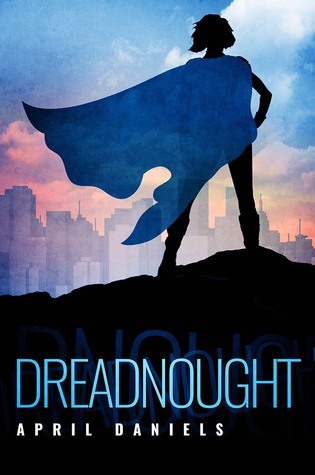 Dreadnought reminded me a lot of Jumper. Danny's father is a class-A jerk with all of the stereotypical issues surrounding masculinity and gender. He makes Danny's life miserable even before Danny comes home outwardly transformed into the girl she always felt she was on the inside. Danny finds that life as a girl, even a beautiful one, isn't as great as she thought it would be. Her friends don't know how to deal and her family can't wait to fix her. And they don't even know the full story, not only is she suddenly a girl, she's a superhero, one nearly as powerful as Superman. 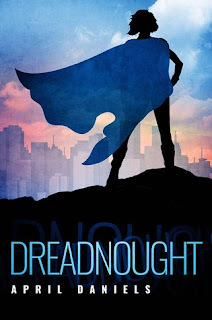 The story alternates between Danny's adventures in learning to handle her body's transformation and all that entails with her attempts to learn how to "cape." She has allies and enemies in both adventures and some of the worst enemies come from inside friendly lines. It's a fascinating book and well worth the read. I love when I get a chance to see inside someone else's experience, after all, that's why we read isn't it? I hated that people were so horrible to Danny just because she didn't fit the mold of what they thought of as normal. Not to say that the situation is comparable, but as a geeky fat chick I certainly faced my fair share of abuse and bullying. At least I had parental support. I don't know that I would have made it to adulthood without it. It makes me so angry when children are mistreated. I don't care what your feelings are about people who are different from you - be tolerant, kind, and loving. It's just the right thing to do.